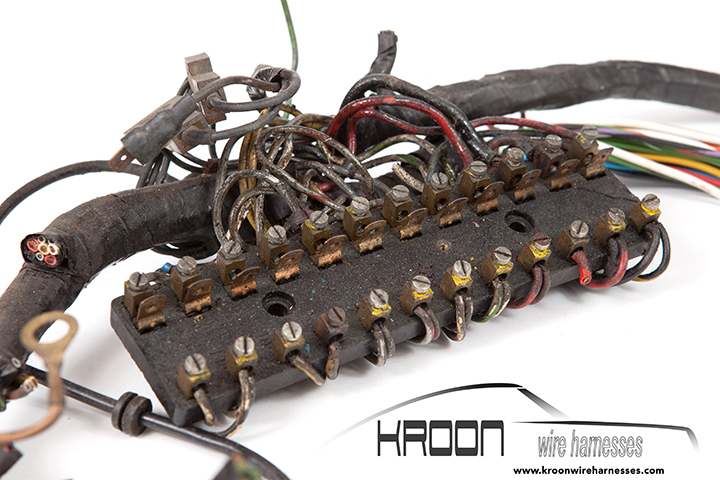 Kroon Wire Harnesses is a company located in the upper part of Holland, as classic enthusiasts with years of experience in electrics and car restoration we realized that during most restorations the wire harness is often forgotten and used again, while thousands of dollars are spend on engine revision and bodywork! There is nothing more disturbing than intermittent electrics in your classic Porsche. Anything from a non-working turn signal through to behind your dash infernos can really spoil your driving pleasure. Sometimes it’s a simple replacement loom, while at other times it’s best to start from scratch. Chasing down shorts and open circuits has certainly caused more than one enthusiast to call it quits with a project. The problem is, the older a car gets, the worse the wiring situation becomes, especially when dealing with 70’s and older cars. As the material ages, it gradually becomes more and more brittle, which eventually leads to entire sections falling off. Not only does this not look good, it is an extreme fire hazard. It takes very little spark to set a car on fire, and the results are devastating. Once the integrity of the wiring is broken, the wire actually begins to deteriorate to the point that corrosion and fatigue breaks the wire, causing an open circuit, or worse, an intermittent open that always springs up at the worst possible moment. Take a restoration for instance. Surely during such a labour of love, the last thing you would do is to reinstall your old wiring harness. 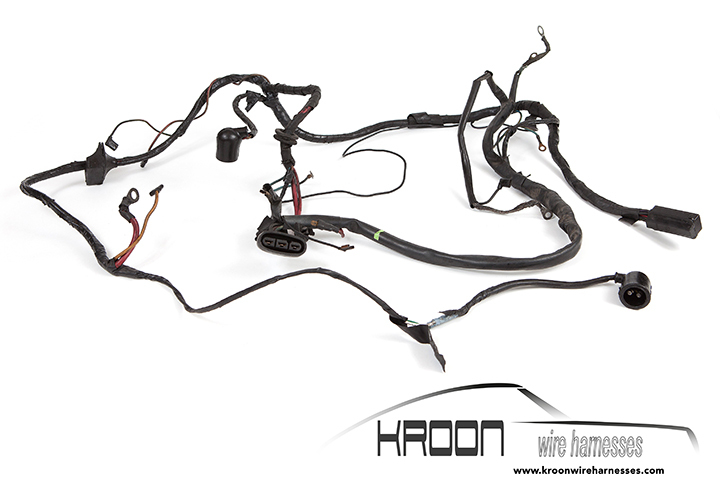 That’s where Kroon Wire Harnesses comes to your assistance; in our archive we have over 300 original looms from which we can make a new wire harness for your classic Porsche. We want to provide the best solution at very competitive prices and pride ourselves on our customer service. Most of our harness sets are delivered “plug & play”, which basically means that installation can be done without any specific electrical knowledge. Most sets are delivered with detailed connection drawings, no difficult to read electrical diagrams but an exact layout of the harness, showing each wire and where it needs to be connected. If a harness (or complete harness set) your looking for is not listed please contact us. We are always looking for new wiring looms to expand our inventory. In most cases we will need your old harness for length and component placement reference. The condition does not matter as long as it’s complete. We always give an attractive discount if we may keep the original. All possible options such as AC, power windows, sunroof etc. For all pre69 models we also like to know if the car is equipped with a hazard switch. For all 356 car’s we always prefer to receive your complete harness. For the 914-6 we always prefer to receive your complete harness. It will save a lot of money if we can re-use the original molded connectors. On request we can also reproduce molded connectors. For 911, 912 1969-1973 we prefer to receive your complete old harness. It will save a lot of money if we can re-use the original molded connectors. On request we can also reproduce molded connectors. For 911/930 1974-1983 we prefer to receive your complete old harness. It will save a lot of money if we can re-use the original molded connectors. On request we can also reproduce molded connectors. When you place an order for a harness that requires a "donor" harness, we will contact with more specific information, after we receive your order. For all pre69 911 and 912 harness sets the fuse box is pre-connected to the main harness. The front harness comes with each wire at the right length and is easy to connect after mounting the fuse box. For all 69-73 911 harness sets the fuse boxes (double 8 pole for 69, or 8+10 pole for 70-73 models) are pre-connected to the main and front harness. All wiring is bundled with waxed lacing wire, exactly the same as the original harness. After mounting the fuse boxes it’s easy to put the main harness and front harness in place. For all 74-82 harness sets the fuseboxes can also be preconnected, but you need to ship us your front fusebox/relay socket panel. (on request we can glassbead blast and paint it) We will pre-connect the fuseboxes to the main harness, front harness, fuel pump harness, powerwindow harness, mirror control harness etc. After mounting the panel it’s easy to put the main harness, front harness and other wiring in place. Even though the wiring project can be completed in one or two days, (depending on the type of car) the level of disassembly alone can take a day. Unless you are an experienced automotive electrician, do not just go through the car cutting everything out and hoping you will remember it all later, but start with each section at a time, removing the old wiring. You can make some notes and pictures. This not only keeps things fresh in your mind, but it simplifies the task in sections. Thanks for visiting and we look forward to serving you!